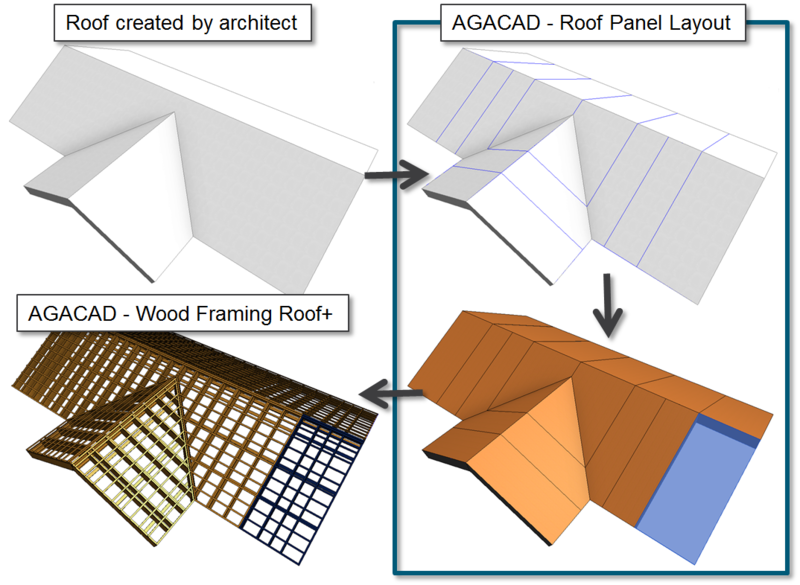 Wood Framing Roof+ enables quick and easy creation of prefabricated wood framing and rafter structures for roofs in Revit® models. Powerful features simplify creation of roof joists, battens, valley joists, roof boards, and more. The software automates shop drawings, including the sorting, tagging, dimensioning, and scheduling of all frames. Roof+ frames prefabricated roof panels. Roof Panel Layout automates panel layout planning of architectural roofs. Based on predefined rules, the software draws symbolic lines that indicate the shape and location of future panels. Then it creates actual Revit® roof panels. 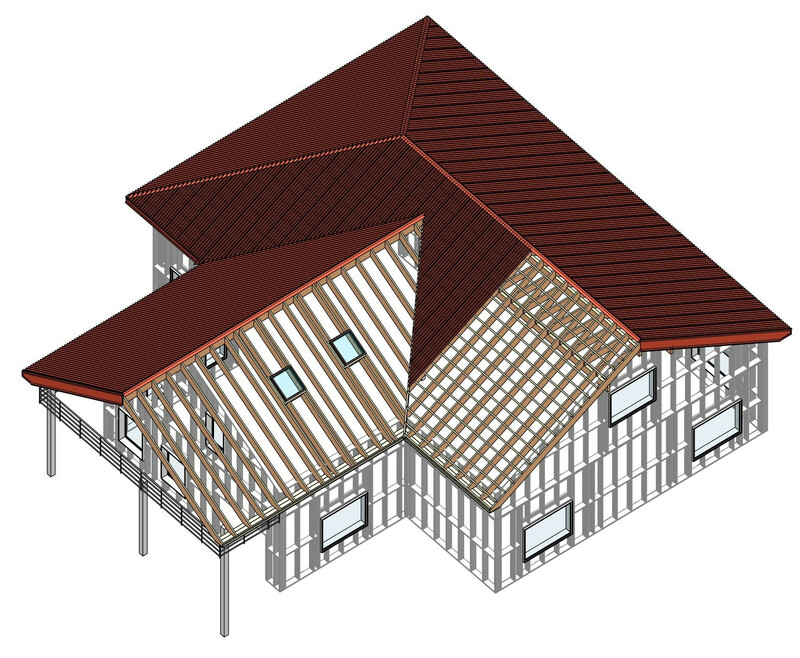 Create your own rules and templates, and use them for creating detailed, multi-layer, timber roof framing in your Revit model. Frame large-sized roofs 10 times faster than using regular Revit features. Control joists, rim joists, nogging, bridging, blocking, and bracing placement. Configure openings, details, service hole positions, and more. Auto-distribute battens, secondary frame, and roofing. Freely revise your Revit model simply by selecting the elements and properties you want to modify. Generate shop drawings and cut lists with just one click. Get real-time take-offs and views, plus automatic sorting and dimensioning. Optional export to any CNC machine and CAD/CAM production line, such as WEINMANN, Randek, etc. Roof frames and shop drawings update and adapt to any changes you make. Carry out structural analysis without leaving Revit, or export your wood frames to external software for analysis at any stage of the design process. 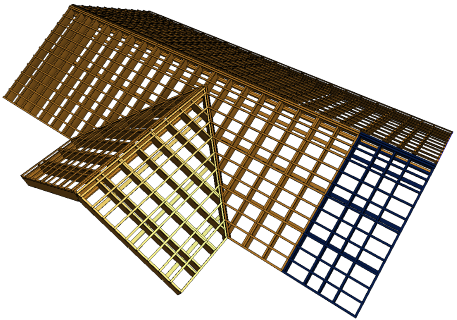 Wood Framing Roof+ lets you quickly create full rafter systems in Revit® models for timber frame roofs of any shape or complexity. Custom-framing functions and versatile schedule generation further accelerate BIM workflow. No more drafting – just design and decide. Automatically split an architectural roof by faces. 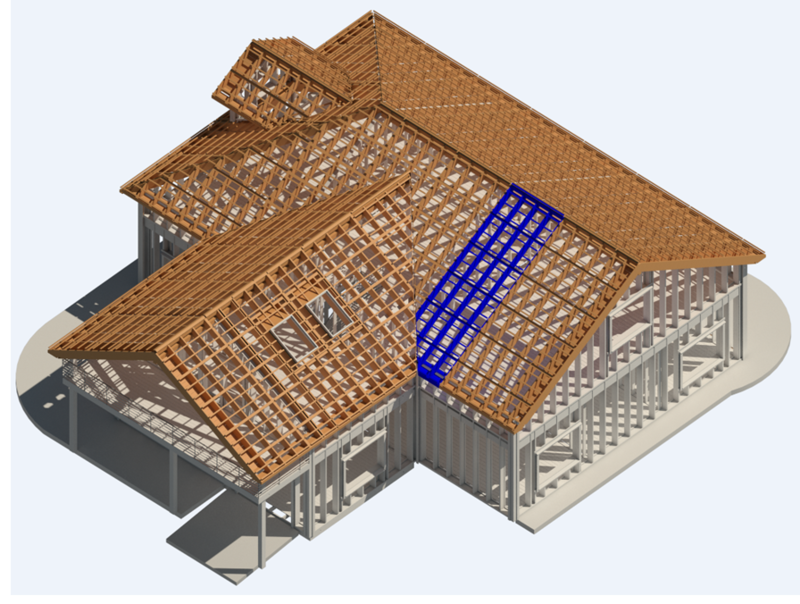 Create detailed, multi-layer, timber rafter roof framing for your Revit model in a snap using fully customizable rules and templates. 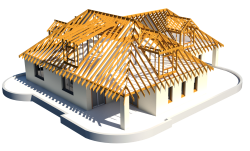 Frame an entire roof based on its 3D model, including hip/valley rafters, ridges, girders, collars, battens, horizontal beams, sleepers, trimmers, etc. Auto-detect and frame roof openings. Cope ends of existing beams. Freely revise your Revit® model simply by selecting the elements and properties you want to modify. Find structural and engineering clashes. Cut and frame openings according to predefined rules. One-click generation of shop drawings and cut lists. Real-time take-offs and views, plus automatic sorting and dimensioning. Roof frames and shop drawings update and adapt according to any changes you make. Perform structural analysis without leaving Revit, or export your wood frames to external software for analysis at any stage of the design process. Structural Engineers Easy and professional roof framing based on architectural roof geometry. Architects Make the real roof design and use it in the model presentation. Possibility of instantly creating prefabricated wood frame roof panels and/or rafter systems of any shape or complexity. 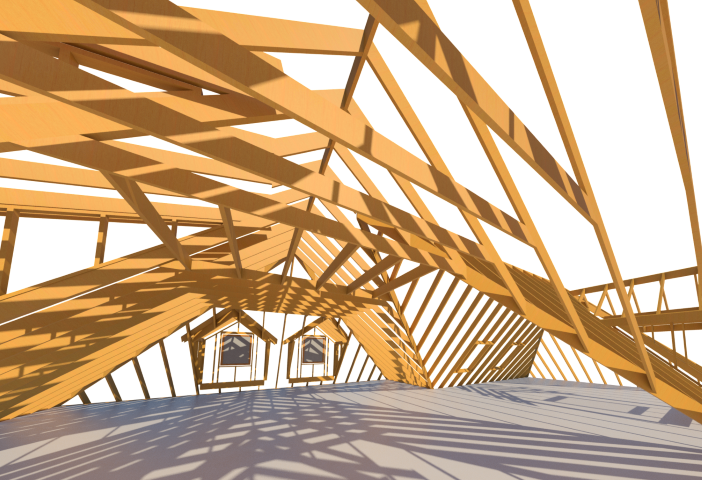 Automated modelling of timber roof framing, including joists, battens, bridging, blockings, rims, noggings, and more. Fully scalable: this software can be used on any structure whether it’s simple or complex, or even an irregular roof shape. Framing types are freely linked with roof types. Complex multi-layer roof framing: an unlimited number of layers can be added. Automated details (support clips, hangers, web stiffeners, service holes, etc.) on bridgings, blockings, and rim joists. Sheathing layouts are easily made and split by existing joists. Automatic sorting, tagging, dimensioning, and scheduling (including mass) of all frames and sheathing layouts. Automatic addition of shop drawing views and schedules to the sheets based on user predefined template. Easily transfer framing elements between the same groups or identical roof panels. 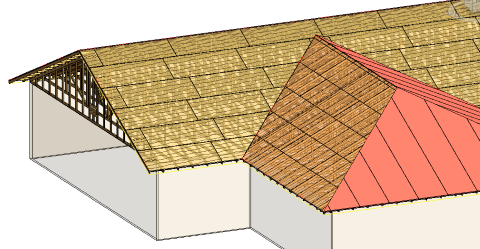 Simply predefine which elements should be affected: all roof panels from the same model group, from the instance model group, or selected roof panel should be unique in the building. Update frames according to architectural roof changes. Align joists across roof segments and between roofs and floors or walls. Modify Roof frame at any time and supplement it with additional members. Edit and increase your library with main types of roof framing. Fully customize all templates and rules. Save framing, sheathing, and shop drawing configurations for your future projects, and share them with your team members. Architectural roofs can be split into prefabricated panels using Roof Panel Layout. It takes an architectural roof and automates the panel layout process. The software draws symbolic lines according to predefined rules to indicate the future panels. Then it creates real Revit roof panels. Optional CNC output to joinery machines and multi-panel production lines enable your model data to be automatically exported to manufacturing. Incredibly Speedy Wood Framing Roof+ is designed for rapid project development. It possesses standardized and automated roof framing capabilities, and that, together with shop drawing generation, enables users to jump over a few major steps in building design. Shop Drawings on the go Shop drawings are produced almost simultaneously as you frame your first roof panel. It i’s so easy to make templates that user might forget about this process. So, don’t forget to check whether everything is in order in the end, adjust a few details and you’re ready to celebrate the delivery of your project. Easy Updates If there were changes done to the roof, the user just needs to update the frame of selected roof segment. LIVE WEBINAR: Wood/Metal Framing for Revit®: New Version – New Features! WEBINAR: ‘Template Project’ functionality for Framing in Revit! Our customer service will get in touch with you within 24 hours. Don’t waste time on reading technical documentation and see that this is the solution for you! Our Expert will frame a part of your project, demonstrate software functionality and share the best practice and efficient way of framing, taking into account your current needs. - Support during the trial period.